There are times in the depths of winter when many of us wish we could curl up and hibernate until spring. Envy the dormouse, one of our sleepiest mammals, who does just this! Some individuals slumber away seven months of every year. Their sleepiness is one of their defining features, and possibly also their namesake; in French ‘to sleep’ is dormir. Their snoozy ways coupled with their nocturnal lifestyle when they are active, means that it is rare to spot a dormouse in the wild. The slim chances of spotting one are further exacerbated by the species’ alarming decline in recent decades. Estimates are that the past two decades has seen dormouse numbers drop by 70%. Britain is home to scattered populations, mainly in south England and Wales. They are absent from Scotland and Northern Ireland. Technically, dormice are not mice. The giveaway is their most distinctive feature; a completely furry tail, rather than the scaly one that regular mice have. Dormice are in a different family to other mice, belonging to the same suborder as beavers and squirrels. They are also distinctive for their golden-brown fur and large eyes and ears. They range in size between 2 and 8 inches. They sleep curled up in balls with their tail curled around their head. There are theories that this is where their name is from, as a dormeuse is a type of nightcap. The hazel dormouse is Britain’s only native dormouse. They are sylvan creatures that spend almost all of their waking time above the ground in trees or bushes and are extremely reluctant to cross open land of any kind. Loss and fragmentation of woodland has led to populations becoming isolated. Lack of genetic diversity in these stranded populations is a risk to the future of dormice as is the decrease of woodland coppicing, as this practice creates an ideal habitat for the species. Ancient woodland is the best habitat for dormice, as they favour uneven, aged trees. Hedgerows are important for dormice too, as they act as bridges between woodland sites. It is believed that the effects of climate change are also affecting the species, as in some areas they may wake too early from hibernation, when there is insufficient food. 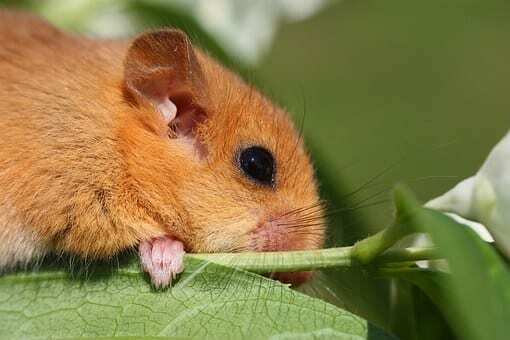 Dormice adapt their diet depending on the season. In spring they feed on flowers, enjoying an early diet of hawthorn pollen and honeysuckle nectar, and in summer they also eat insects. In autumn they feed on fruits and nuts, rich foods that ensure they are suitably fattened up in order to make it through winter; they must double their fat-reserves. Hazelnuts are their preferred autumn foodstuff, and any they’ve munched on will have a tell-tale round hole. If forage is poor in summer, they will enter what is known as a torpor state—sleeping in their nests to conserve energy. Every summer dormice will have a litter of up to five young. They are raised in nests woven from grasses, leaves and bark that are built in trees or hedges. The young will perhaps survive three summers in the wild. In October or November they will build cosy nests on the ground and under leaf litter or log piles, sheltered places where they can weather more easily the extremities of winter temperatures. The woods of west Wales are lucky enough to host dormouse populations. Nest boxes set up by Mammals in a Sustainable Environment (MISE), have been inhabited in Cwm Clettwr in Ceredigion since 2012. The recorded number of dormice has increased annually since then. A short way from Cwm Clettwr is Cambrian Wildwood’s site Bwlch Corog. Our work of restoring woodland to this area will hopefully provide a safe haven for this sleepy and charming little critter.